DS: Could you guys tell us about your respective roles in the sound of Fable 3? How was your relationship with the rest of dev teams? 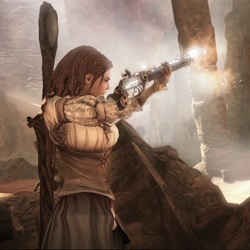 KM: I am the Sound Design Director for Fable 3. As a Sr. Audio Director in the central audio team here in MGS it is my job to help both internal and external titles however I can. I’ve worked with Russ Shaw for 3 years now, overseeing the Sound Design teams for both Fable 2 and Fable 3 so he can stay focused on music composition. SP: I was the sound supervisor and one of many sound designers from the Soundelux DMG team. Our Creative Director Scott Gershin also creatively supervised the project and added his mixing talents to the cinematics. We worked on weapons, creatures, spells and cinematics. KQ: I was acting Sound Design Supervisor at MGS. It was my job to work very closely with the Audio Directors to help understand and establish the creative vision as well as make sure that it was well executed. I worked with the Lionhead team daily, providing feedback on everything from audio system design to feature expansion in the tools. I also worked with them to establish their content needs, provided audio implementation, as well as content creation. When it came to implementation I was extremely combat focused, but I also worked on the ambiences, and creatures. Sitting overseas from the dev team meant that we had to communicate extremely well to achieve our design goals. The Lionhead team is an amazing bunch to work with and they were always very flexible and willing to meet with our team by any means necessary. We had desktop sharing sessions, play sessions over XBOX LIVE to do walk-throughs, and very regular conference calls. Even though we were across the ocean from them, they did an amazing job to make us feel included and like part of the team. DS: What were the new challenges/goals in the sound of Fable 3, compared to the previous Fable titles? 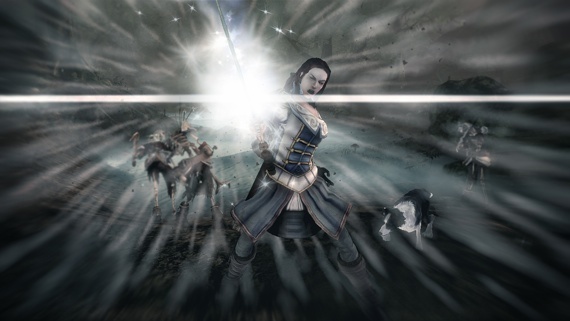 KQ: For Fable 3 our main goal was to create a more delicate sound. We wanted to create an experience that a player could play over long periods without fatiguing the ears and without losing any detail in the design. We wanted the overall sound to feel more natural so we tried to record everything while keeping the perspective in mind. We spent a good amount of time in the beginning of the project pulling reference as a style guide to create a general direction and feel. We also spent a lot of time creating a vocabulary that we could use to describe what we were imagining. This helped to keep our sound design consistent and uphold the original vision that we set out to achieve. The challenge of doing any Fable title is always the sheer amount of unique and detailed content necessary to create a believable world and the highly iterative nature of Lionhead’s development process. 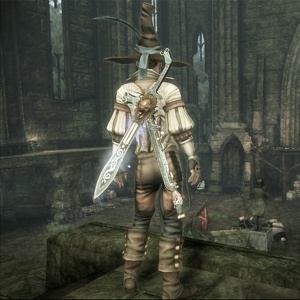 The unique challenge with Fable 3 was the schedule. This was the first Fable title done in two years. 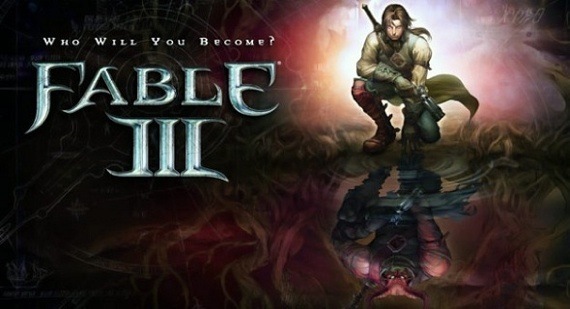 Fable 1 and 2 took three years to develop. This made the overall schedule crunch up at the end, which caused some extreme time pressure for us on the sound design team. When you put that with some late game design changes and a slow pipeline it really caused extreme amounts of work for the sound design team. We are very very happy with the end result, but there is a lot of skin on this game from all of us. SP: For our team it was the weapon design. We had to give each weapon its own personality, and weave them in such a way that gave a subtle tasty hint of that weapons particular characteristic. There was plenty of experimentation during this phase of the design. We worked with organic and other worldly elements experimenting with different frequency ranges textures and tones to give each weapon its own sonic identity. Brad Beaumont one of the main weapon designers did some really cool sounds for the Crystal weapon set using Soundtoy’s Crystallizer plug in. This was a weapon where tonal content worked pretty well however with most melee and ranged weapons we found that any tonal material that was musical did not fare well. We recorded several different types of metal on the foley stage and tried to use similar elements across an entire set. For example, if there was a really nice clean ring to one of the metal elements used for one of the swords we would try to incorporate that element into the dry fire, shot or report of the pistol and rifle. DS: The gameplay on Fable 3 is very unique for me. The player has a lot of flexibility and opportunities for exploring all kinds of places, discovering new things, etc. How this structure affects the way you structure the sound of the game? KM: The scripters at Lionhead are ultra-creative. They are also very good at making lots of difficult sound design challenges for us! We love creating the crazy content from giant doors to singing chickens to floating magical metal puzzles. We strive to create a seamless experience for the players and fill the world with so much detail that even on the edges, there are new things to discover. 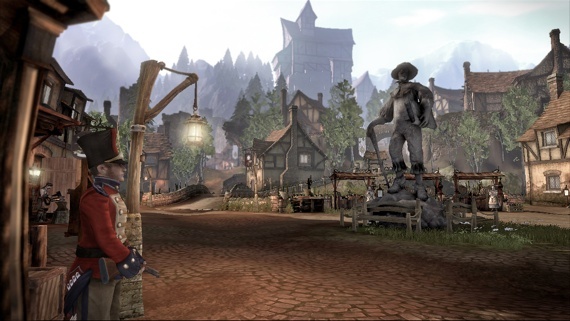 Fable players tend to play these games for a very long time, with multiple play-throughs and exploring every nook and cranny. They can even do it in co op, both on a couch or over Xbox Live. We want to reward that curiosity and passion with a full experience, no matter how many times you’ve played through. To accomplish this, we try to do a full sound design for every object in the game. What this means is we don’t just say “metal door” and put it on all the metal doors. Each door has full unique sound design broken into layers so it keeps the perspective correct at different radii. We don’t just do this for doors, we try to do it for everything. This extra effort pays off greatly in co-op, as we try not to ever break perspective for the 2nd player, no matter where they are. The big technical challenge is to fit all of this unique content into memory without compressing the hell out of it and ensuring that it gets loaded. We track every asset in the entire game and load it by hand at every region change. It’s a painstaking process but it assures that we can maximize our memory. If we did big lots of generic content this wouldn’t be necessary but we take the pain so we don’t have to compromise the vision. KQ: We try and create a unique experience for many play-throughs. The Lionhead Audio Programmers created an amazing load on demand system for us that helped us manage our memory while supporting an extremely large amount of content. We hand load into regions, but this system allowed us to not have to carry as much at any given point in time. For environments we tried to make every region sound unique. If you are playing as good, or evil then we try and support this in subtle ways as well. If you get knocked out you might notice the ominous background loops change based on if you are good or evil. We always try and pay attention to choices that are offered to you in game. Are you barefoot? Do you have armor on? We try our best to build out our sound design based on the decisions that the player can make. DS: Could you guys tell us about how much field recording was needed to give unique elements to the game? What kind of sources you recorded? KM: We did a ton of Foley, with two different teams in LA and a bunch here in Soundlab. Every weapon, movement, cut-scene, object, and creature had unique Foley performed and edited for it. A lot of nature recording was done for the project. My guiding principles for the ambience on this game was to “idealize nature, create emotion in the city”. Kristen did a lot of work and put a ton of care into the ambiences in the game, making each region and sub-region unique. A lot of it was from original recordings. To be honest the list is almost too big to go into! Each sound in the game has a story to it. SP: Scott Gershin, myself and a few other recordists recorded wolves at a wild life sanctuary as well as in the studio. You get different performances and added fidelity when using the studio, but you also run the risk of the animals not wanting to perform because they are in an unfamiliar place. With recording out in the field you may get a better variety of performances but you are at the mercy of the elements and your surroundings. I remember recording some really interesting howls from one of the wolves then all of the sudden we heard a pack not too far away respond by howling. It was a call and response moment that overlapped. So needless to say it was a little difficult to get a clean recording of the single wolf howl we were going for. In the studio Scott Gershin set up and elaborate microphone array. This was designed to catch all the different nuances of each growl, snort howl etc accounting for any direction the wolf might move. There’s no directing a wolf. KQ: Our team did a lot of environmental recordings. We set out to create as real of an experience as possible. To achieve this we recorded as many sounds as possible in their natural environments. We went on camping trips, took hikes through forests, and even adventured through a couple caves. The goal was to collect sounds that had a natural sense of diffusion and would translate 1:1 with the environments in the game. DS: How was your approach on the armory, melee combat and the different abilities of the main character? KM: Our main drive for the hero in Fable is to have unique sound designs for everything that can change, that way the hero “feels” the change as much as possible. In Fable 2 every weapon the hero used, an NPC could use as well. That way we just sound designed the weapon itself and let whoever wield it perform the moves they were allowed to. This worked out pretty great, although it was a lot of weapons to sound design. This time around the arsenal from the last game was distributed through the NPCs and an entirely new “morphing” arsenal was added just for the hero(es). The idea of a morphing weapon is that as you complete certain tasks with it, the weapon changes pieces (hilt, blade, FX, etc) of it to reflect the user’s history. This makes it possible for tons of unique versions of the weapons. The design challenge that we had was to determine how the sound of a weapon changes and coming up with a way to fit that in memory and support drop in/drop out co-op. Kristen had an enormous challenge with this system but I think she created something that is incredibly impressive. KQ: This time around we wanted to create a sound design that would provide us with more distinction between weapon types and would elicit an emotional response from the player. For Fable 3 we decided to go for more iconic versus literal so we decided to give a unique sweetener to every weapon type that would define its personality. If you had a weapon made in the new continent of Aurora, which is a desert area, you might hear an element of sand in the sword swipe or gunshot. We had to sit down with all the weapons and decide what that iconic element was going to be. We worked hard to create a cinematic feeling to combat. We wanted the player to feel the big moments, so we came up with a unique design that was supported across all of the combat finishers. Soundelux did an amazing job collaborating with us on the combat designs and working iteratively until we succeeded in building what we set out to achieve. DS: There’s a nice dog that helps the character in several moments, doing exploration tasks and playing important roles in several moments. How you developed the sounds of the dog? KM: The dog is always very difficult. I handled the dog last time, Kristen handled him this time. At the end of Fable 2 we broke down his sound design and Kristen created some all new systems to increase the detail on him. Many of these are very subtle but we love the subtle stuff like how his toenails click on stone. KQ: We had certain goals in mind of what we wanted to do differently with the dog. 1) We wanted to change the perspective. 2) We wanted the dog to feel more grounded in the environment. 3) We wanted to have a wider personality range in our sound set. To do this we had to expand the dogs sound set. What you hear in game is actually a combination of dogs that were recorded at Soundelux during the production of Fable 2 and some new dogs that were recorded at MGS Soundlab. We recorded 8 dogs this year and focused on pushing the dog’s perspective out in our recordings. Often in game you are hearing barks when the dog is off in the distance trying to get you to come get the treasure that has been found. We wanted to make that feel very natural. SP: The movement sounds were created on the Foley stage at Todd AO. For the snow footsteps we used real snow. We mic’d the foley slightly off axis to give the movement a more natural feel. I also feel that the implementation was really done well on the dog. You hear just a sprinkling of his footsteps and chain movement. It’s never overbearing and you always have a sense of his presence. KM: There were really two parts to this: Pre-rendered movies (FMV) and in-game realtime cutscenes (ACS). For the FMVs, the intro cinematic, when I saw it, I was incredibly excited. I think it’s one of the best of all time. I knew that we needed to really do something special with the audio to do the picture justice. Soundelux has been our partner for two games now and they have some really great expertise in this area. It was a natural fit to trust them with the post production for this piece. I did the approvals on the Microsoft side but really it was trusted to Shannon and Scott to oversee and make awesome. Their sound design and mix, paired with Russ’s incredible music, all came together fantastically. I think the hardest thing to get right was the voice of the chicken. Walking that balance between realistic and cartoon was very difficult when dealing with an animal voice. For the ACSs, we were under an extreme time crunch for these and the pipeline was very, very limited for them. What I ended up doing was booking two days of Foley with Gary Hecker(legend!) at ToddAO and slamming through about an hour’s worth of cutscenes. I knew the score would be handled by Russ and a few big moments like the Coronation scene we could cut the big sounds for. The big challenge was going to be cutting enough unique sounds to sync with all these scenes. Foley is very, very fast in this regard and we got some fantastic material. Some of my favorite details are all the little “hands-on” sounds we have for people interacting with things and the jangle of Sabine’s jewelry. Really, the Foley went so fast the process bottlenecked on me actually getting the sounds into the game. Because the frames could drift, I couldn’t just create a single multichannel mix, play it on frame 1 and let it play out to the end. Things would get out of sync. What I ended up doing was cutting the Foley into individual parts, looking at a timestamp of where they should play against a rendered video of the scene, creating a trigger and playing it on that frame of the animation of the entity it should play from. This didn’t always work perfectly due to the time drifting so on some I had to capture the output of the game engine, count frames and adjust the animation keys by the amount the output was off. Describing it is about 1000x faster than actually doing it. It took weeks of crunch just to get what we got in the game. Animation changed afterward too, so this portion of the project was a bit of a nightmare to complete! Despite all that, I think there’s some really great stuff in there like Reaver’s cane taps during his speech with the protesters. By doing the sounds in 3d on the entity, the perspective changes as the camera cuts and it works rather well. Coronation sounds awesome. SP: Under the direction of Kristofor Mellroth, Scott Gershin and I creatively supervised 4 of the cinematics. We had the most fun working on the Intro Cinematic. In this Intro you have kind of a comedy of errors. This poor chicken just wants to fly but ultimately finds himself in the worst of any situation. It was mission critical to get the chicken vocals to evoke the proper emotion. Out of the gate, we took a more cartoony approach that just didn’t cut it so we decided to go with realistic chicken recordings using pitch and timing for inflection and I’m pretty happy with how they turned out. We also had a great team of sound designers helping with the design as well as an amazing foley team. Scott Gershin did the mixing on all 4 cinematics. The goal was to let the music carry the emotional content while letting the sound effects add the punctuation. I think overall a nice balance was achieved between the music, sfx and dialogue. DS: How you collaborate as an audio team? Could you explain us how is your typical workflow, and also… what kind of software/hardware tools you guys use? KM: This is an unconventional audio team by most standards. There is a lot of opportunity for disaster when you have stakeholders at Lionhead, MGS Central, Soundelux and with Peter Molyneux all involved. But we all love of the Fable franchise and inherently trust one another. We are all so committed to making this the best game possible. We consider the Fable team more of a family than anything else. We stay in sync through weekly conference calls, email at all hours of the day and night, IM when we cross over in real time. After two full games together we do have a shorthand between everyone. How else could you have a sound in a game called “goop shoot” and no one even laughs about it. SP: We worked under the direction of Audio Director, Kristofor Mellroth and Sound Supervisor Kristen Quebe. 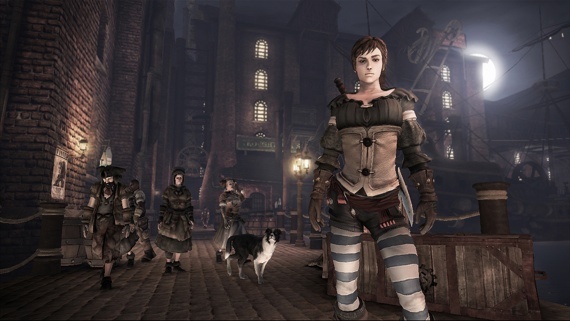 Having worked on Fable 2 we had already established a rapport with the Microsoft team which prepared us for Fable 3. Kicking off the project we had a preproduction meeting where a list of assets was studied that contained each category we’d be working on. This was a full day going through concept art and discussing the sonic landscape of the game. Once the project got underway we did some concepting, to picture if we had it, then passed it off to the Microsoft team for approval. If Kristen and Kristofor liked what they’re hearing they would test it in game and then send out a new version of the build to our team so we could have a discussion. Sometimes there would be a few rounds of tweaking after that point to get it just right. During the project we had weekly conference calls and had instant communication via Skype. This instant communication was really helpful through the production and if anything allowed for a little comic relief through ridiculous messaging. Having weekly conference calls with Microsoft and receiving updated builds on a regular basis helped keep the project on track. After we received a build with the updated material, say weapons for example, we would go through and play each weapon in a variety of circumstances and make notes. We compared notes and agreed on the best way to move forward. It’s the only way to critically analyze the work. “How does it feel when I fire this weapon? How does it sound during a big combat moment with several other weapons firing?” You have to hear the sounds in context to be able to move forward and Microsoft is really good about keeping us updated. Working as a third party vendor you don’t always get access to builds so I have worked on games in the past where you feel as though you’re designing in a vacuum because you ship your sounds off and have no idea if they will work or not. Being able to hear your sounds in context while playing the game is the only way to make a solid critical analysis of the games audio. We use Pro Tools at DMG and a number of plugins to aid in the process. My personal favorite plugins at the moment are those from the Soundtoy and Ozone packages. Aside from plugins, we really enjoy going out and recording new material for each project. This includes the foley stage. I really enjoy the process of creating sound to picture organically. KQ: Initially our team creates design docs for every audio system in the game. We worked with the Lionhead team to ensure that we had the tool functionality and code support needed to achieve the design for each system. We had 2 audio implementers (Jordan Stock and LN Lurie) sitting on site with me of whom I supervised. We all had different systems that we owned and were in charge of overseeing. I really like this approach as it creates a sense of ownership on projects for each contributing individual. Each person would create an asset list for their systems once a design was signed off on or prototyped out in the tool. We also created content ourselves, but primarily focused on implementation and systems. If we were working with Soundelux we would have a conference call before starting an asset list. Shannon and the MGS team would discuss how the system would function and general direction for the content. We used a 1st party tool created by Lionhead for getting sounds in the game. In terms of audio tools, we tend to jump between Pro Tools and Adobe Audition on the MGS side. Most of the Soundlab crew runs Pro Tools HD systems. Each morning the MGS audio team would meet for morning stand ups to discuss what we planned on working on for the day. This is also the time we used to prioritize tasks and make sure that all of our focus was in line with the schedule. We also do a lot of review and critique sessions. This is where we would always pull Kristofor in and get feedback and expertise. DS: Could you tell us about the mix and implementation process of the game? What kind of system did you use and how was your work there? KM: Mix on Fable was an interesting process. Since we were in different countries and in the final stages of production, it was impossible to get us all together like we did on Fable 2. Instead, we did a distributed mix. We focused all our efforts during the same week but in different locations. Georg mixed VO, Russ mixed music, and my team mixed the sound design. Soundelux mixed the FMVs and matched the VO levels to the in-game VO levels. We don’t have a very nimble tool for mixing so every piece of data must be touched individually. Our mix process goes like this: Isolation sandbox pass (each feature separately against itself), category sandbox pass (each feature against others in the same category), core game (real playthrough), then optional quests. During the entire process, every mix change is tested against both single player, single screen co-op, and online co-op. It takes a long time. 12-14 hour days for 5 days straight. Then during the final phase of development we keep playing and playing and refining until we get locked out. We try to sanity check everything. The game is so massive, honestly it’s extremely hard to see it all during a condensed mix. We did make some mistakes but overall it sounds like the game we wanted it to and we’re very, very proud of it. We hope everyone likes it. KQ: We build everything in layers. From far away you only hear distant elements but up close you get additive layers that add detail. We use this approach on everything from a door in the game to weapons. We also like to support dedicated LFE content. Having worked with Kris for many years he has instilled his methodology in me of rewarding the user for having a hi-end audio system. To combat this when playing on different systems we use a Wave Arts limiter on our signal chain and support setting changes from the in game menu. From here you can switch what type of environment you are playing on. Are you on a 5.1 system? Are you playing on a TV? We have different compression settings on each so that we are not punishing anyone for their listening environment. In TV mode you will get 10 to 12dB of compression so that we bring in our dynamic range and hopefully the user is still able to hear the things that they need to hear. We also balance this using the analog outputs of the Xbox 360. Many games clip the output of the console when running in analog because of volume boost that occurs in the 5.1 fold down. We do captures and monitor our analog outputs during mix time to ensure this doesn’t happen. DS: There’s a lot of physical interaction and social activities between different characters in the game. How you dealt with this? Any key aspect on de dialogue or the sound system to achieve good results in that aspect? KM: The expression system is something that is really cool and went through a lot of iteration. I challenged LN Lurie to make it a special feature and she did a great job of iterating on the design. She worked with the team at Lionhead to get a lot of detail into it. It’s a very difficult challenge to execute on. It’s a combination of physical Foley, what we call “vocal Foley” and vocal performances that range from funny to serious. Getting actors to perform these types of things while adhering to the technical limitations necessary to make the system work is very challenging. The Expression system alone is about 10000 lines, which is more than what most games have for all their dialog combined. The sounds for it are a combination of dialog called via code and sounds effects called through animation keys. The whole thing is so complex it’s kind of a beast unto itself. When you combine expressions with the entire cast available and every script, you get about 65000 lines or something like that for F3. It’s no wonder Georg only slept 2 hours a night for about 9 months. KQ: We went through several iterations of how to design the touch expression system for the game. LN was in charge of supervising that system and working with the VO team in the UK to make sure that we achieved what we were after. At first we prototyped out a system that was very foley rich with grunts and groans, but as the decision was made to give the hero in Fable a voice that opened up a world of opportunity. We quickly realized that we needed to move this into the speech system. The VO and writing team did a stellar job in coming up with some very great and comedic lines for all of the characters in the game for this system. Absolutely epic overview of the process! Loved hearing about the distance based layering and content swapping.